Candid is built to support the evolving needs of global brands and e-tailers that operate in several markets. While this article provides an introduction to the localization concepts and how brands can configure their collection(s) on Candid for each of the markets and/or languages they operate in, it's best that you discuss with your account manager as there are other shades in between the options outlined here. Under this option, a single collection is used for all country/language deployments but the Mapping Tags within that collection are localized as needed. This means what's collected, how it's organized, who can access the moderation facilities, etc. are all the same across all countries and languages. But, what can be varied for each country/language are product-level details (e.g. URL, name, inventory, headline, etc.) as well as presentation elements like the 'Add To Cart' button or the CTA headlines that appear in the right margin of the overlay. Moderation happens only once as there is only 1 Mapping Tag per product, meaning there is no additional workload for each of the supported country/language deployments. Once you've confirmed that localized values are populating correctly on the back-end, you can then localize display plugins by specifying a language parameter (e.g. language:'fr') in candid.init(...) or candid.wall(...) calls. In the event that a specific product tag doesn't have a localized value specified for the language requested, it will simply default to using the base language. Please note that the language for the upload picker has be separately provided in candid.upload calls. 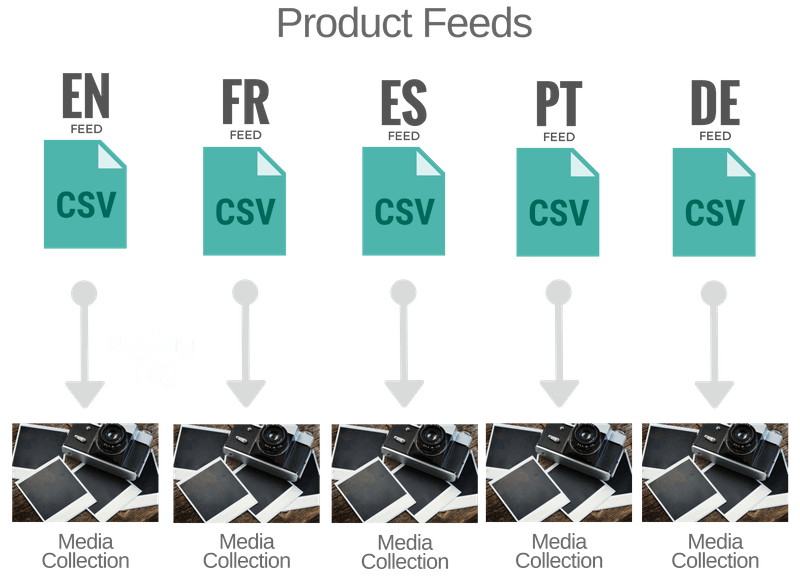 We'd like to go with Option #1 and have an EN, FR and ES feed that we'd like to connect to primary collection. Do all of them have to be in the same format? Yes, all feeds connected to a single collection to have consistent formatting. Are all feeds refreshed regularly? Yes, whenever the primary product feed is updated (on demand or its normal schedule), the alternate product feeds are also imported. However, for alternate language product feeds, only product IDs included in the main feed are supported. For instance, if your EN feed doesn't reference product ID 107521, but your FR feed does, it will simply be ignored during import. How do PDP installations work under Option #1? Other than providing a value for the language attribute on the installation scripts, PDP installations will be exactly the same. Reverse lookups based on tagUrl will work across all URL variations. Can we link to web pages or products not included in our feed? Absolutely. When you create a new Product Tag, all localized properties will be editable. 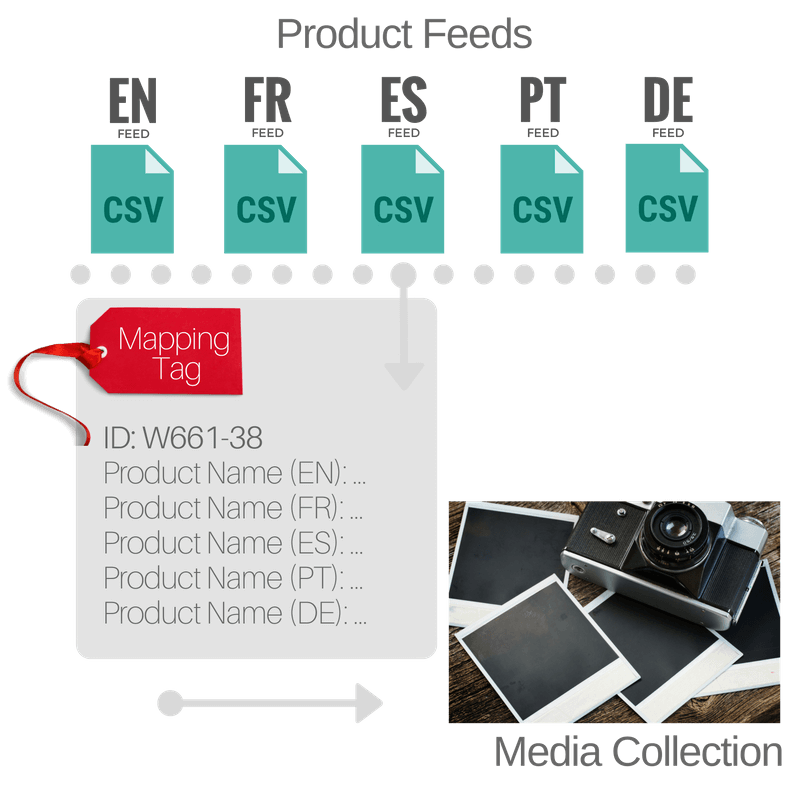 Just as with non-localized collections, as long as the ID selected is one that is not included in your product feed, all of your changes will be preserved through on-going imports of your product feed. We currently run Candid on our Australian site and are soon launching a European site which will also have Candid. The EU website is a straight clone from the AU one so the galleries automatically populate on both as they each have the same Candid code implemented. We also use the Instagram storefront, and I’m wondering how to manage user click throughs from specific products from the storefront? Normal website traffic will be geo-fenced so that anyone with an EU IP address will be automatically redirected to the EU website and anyone with an IP address from any other continent will be directed to the AU site. Is there a way to redirect customers clicking through from the Instagram storefront? This scenario is actually quite common and is handled generally by a "canonical product URLs", meaning the product feed connected to Candid references country-agnostic product URLs that automatically redirect users to the right regional website. Under this scenario, if the product names are common across each of your markets, no additional configuration is necessary. If the product names are localized, then we can enable just that field as a localized value in your collection. Under this option, each market will have its own dedicated collection on Candid, meaning each can monitor unique streams of incoming content, each will be accessible by different teams, and what's published can vary as well. Under option #2, each collection has an independent product feed. From there, teams generally setup a shared email/password-based login (e.g. social@brand.com) that has admin access across all collections then setup regional access (using different logins) such that regional logins only see their own collection and not the others. Permission changes currently are handled through a new ticket to support@getcandid.com. Please see the FAQ under Data Modelling for the various roles available within a collection. Can changes be published from one collection to another under Option 2? This is possible but it's not an operation that's accessible on the UI. We have several workflows in place for teams that are tailored to their requirements. What about rights management, does this have to be done independently in each collection? This largely depends on whether each collection is anchored to its own social identity or whether there's a shared (central) social identity that would be used for all rights exchanges between the brand and its community. In the former case, it would be completely independent. In the latter case, it can be done inside a single collection and published out to the others. How do we ensure consistency in the style/theme across each market? The collections can be easily configured to share the same display settings. If we manage a single Instagram account and a single Instagram Storefront, how do we load content from one of our market-specific collections? The Enterprise tier supports GEO targeting where visitors can be redirected to the appropriate storefront by country, state, city, latitude & longitude. Your Instagram profile link would simply remain shop.brand.com (or equivalent) but clicking it would redirect to the appropriate experience based on the configured redirect rules.